Our all rounder Classic Timber range of paddle boards are best for flat water, cruising and surfing. A great all rounder board with our distinct nose and shape, this board is maximum on stability and buoyancy. A great beginner board that you can take to the next level in your own time. The NEW 2019 Summer Woody Cabo is the latest edition to our Classic Timber range of boards. 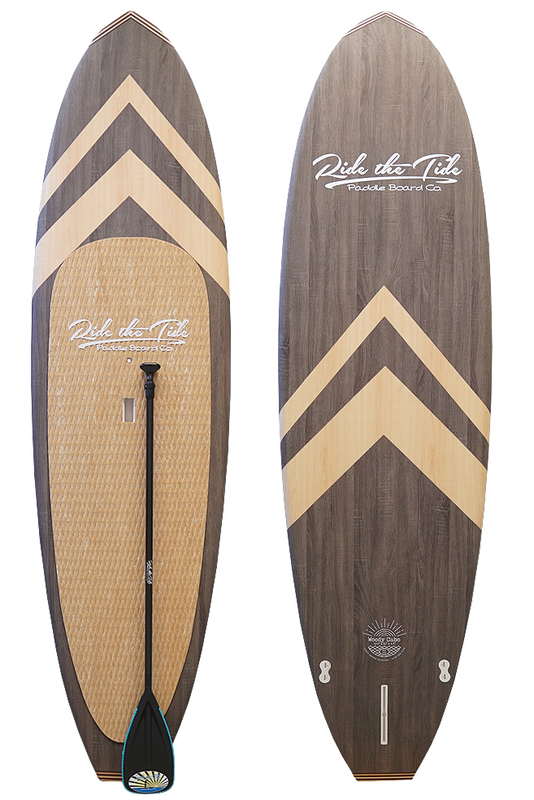 Featuring a timeless dark grey driftwood finish with contrasting light beach timber chevron shapes, the Woody Cabo is a simple and beautifully designed paddle board. Our fresh new twist to our Classic Timber range is the subtle yet stunning Matt finish to the board creating a total cool new look to our boards. Traditional contrasting light and dark timbers and true timber nose and tail features are true to Ride The Tide and are a salute to the days when life was simple. • A versatile paddle board performing both beautifully in flat water, rivers, open ocean and small to medium surf conditions. • Lightweight and a breeze to carry with our ergonomic ledge grip handle. • Double concave hull providing increased paddle efficiency and stability through the water. • Beautifully hand crafted completely wrapped in exotic wood veneers and a soft timber grain designed diamond deck grip. Ride The Tide Paddle Board Co. has been a pioneer of Classic Timber Paddle Boards since 2013 evolving to encompass our core brand of a coastal lifestyle built on simplicity and a laid back attitude. Life should never be too serious. Join our tribe, kick back and relax. Our unique Ride The Tide traditional longboard style and attention to detail complements our quality, construction and competitive prices. We raise the bar when it comes to producing the best looking SUPS in the world making choosing your ideal board easy. If you need any help in choosing the right stand up paddle board or have any questions, please call Dean anytime on 0403 549 702. At Ride The Tide we are all about making your purchase easy and ensuring you buy the right board for you. We are always happy to help. ✔️USAGE: Flat Water, All Round, Surfing. ✔️DIMENSIONS: 10' x 31" x 4"
✔️CONSTRUCTION: EPS Foam Core + Timber Stringer + 3 Layers 6oz and 4oz Dura-Bond Matt Fibreglass + Additional Fibreglass in Standing Area + Machine Baked Epoxy Casing. Purchasing 2 or more boards? Call us on 0403 549 702 for multiple discounted freight rates. Brand New 2019 Summer Edition! Size -- Please Choose an Option --10' x 31" x 4"
Includes Board Bag, Paddle Bag, Leg Rope & Rail Tape - $370 Value! Protect your new Ride The Tide Stand Up Paddle Board with our popular Protection Pack.